Women Of Purpose: Paint With FAITH! Ladies, are you ready to have some fun? It’s the night we’ve all been waiting for!! 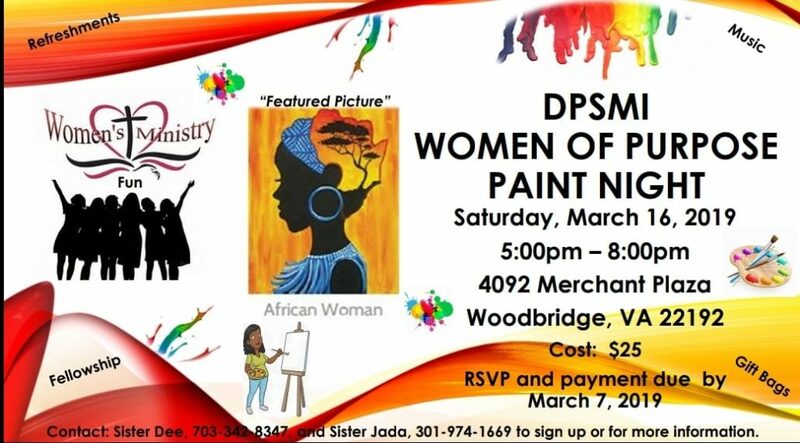 Saturday, March 16, 2019, is the Women of Purpose Paint with Faith Fun Night at DPSMI from 5-8pm in the multi-purpose room. Come on out and join in on the fun as we paint, eat, laugh, listen to some of our favorite songs, and just enjoy each other’s company. We’ll have gift bags for all our guest, so be sure to bring a friend!! Hope to see you all there. Sign-ups have begun, so please see Sister Dee and Sister Jada to secure your spot. Please see the attached flyer for further details.